Or more particularly let’s talk about sugar tax and Jacinda’s announcement about a regional fuel tax. As of last week my gap year officially ended. Really keen now to go back to being a grownup. Trouble is still don’t know what that looks like. So as a bit of a transition path; decided tutoring tax to lovely young people at Victoria would be a good idea. Had no idea it would require seven hours of training – don’t ask – before I could get in front of them though. But all over now and three weeks of actual tutoring has now taken place. Hence the transmission silence. Now the first week of classes included a question on legal v economic incidence of taxation aka who bears the tax aka taxes are gross. 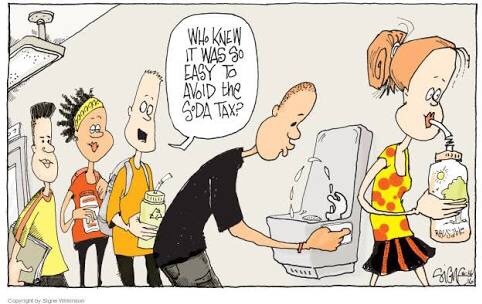 And since I last posted the Sugar tax people have done some work and the lovely Jacinda – who may or may not have a baby as PM – has announced a regional fuel tax to fix Auckland. Well transport anyway. So as this is what passes as topical these days for tax; today I’ll look at sugar and petrol taxes. More similar than you’d think. And both come down to who pays the tax is different to who bears the tax. TAXN 201. Now while a sugar tax is but a dream of public health professionals; petrol tax is currently in existence. And unlike GST which cascades; petrol tax is an excise simply applied either at the border or at the refinery. Same applies to alcohol and cigarettes – except for the refinery bit. One off charge to producers or importers which then flows through – or not – to the final consumer. Now there is the whole ‘paying for roads’ thing with a petrol tax but fundamentally it is a tax because we can. Petrol – almost like insulin – has a relatively inelastic demand. No or minimal dead weight loss. No triangles. What’s not to love? And because of this no deadweight loss/inelastic demand, the tax that is paid by the oil company feeds through to the price paid by the car driver. And so my aversion to driving and cars makes it a form of legitimate tax avoidance. Sweet. But otherwise tax is raised with little change in behaviour. Now a regional fuel tax is interesting. I guess the vibe is that petrol that is consumed in Greater Auckland gets the tax and petrol that isn’t – doesn’t. It could be that the destination can be broadly worked out once it leaves the refinery on its way to the Wiri tank farm. Auckland pipeline or something. In which case it will be a matter of the oil companies adding another set of codes to their computer system. I’m sure that they accept that without comment. Even then there’ll probs need to be a crediting system for fuel delivered outside the taxable region. Alternatively if it can’t be worked out – then it will have to be charged by the individual petrol station. Possibly by the oil companies when they deliver to them. They’ll enjoy that too. But one way or another because of our carbon economy, serious money will be raised. Perhaps more buses will be taken but broadly Auckland car drivers will have less money to spend on other things. On the other hand – the Sugar Tax people’s gig is not that they want revenue raised per se. Although they do have a laundry list of stuff they want the money spent on. More that they want an increased price so that less of it is consumed. Because health reasons. And as someone who has a tricky relationship with the white stuff – am sympathetic. But whether it ends up being a corrective tax with some revenue raised – like cigarettes – or just a tax grab all depends on the elasticity of demand for it. If we turn our minds back to taxes are gross. Wage income has an elasticity of 0.414; non- wage income of 0.909 – source Treasury. While cigarettes have an elasticity of 0.5 – source my aging brain. Now working on the assumption that sugar is less addictive than cigarettes and less embedded than Auckland car driving; all things being equal there should be less of it consumed. So although it would have a similar structure to a petrol tax it would be a corrective tax rather than a revenue raiser per se. Although with cigarettes it does a good job at being both. But as is seen with cigarettes the tax has to get to eye watering levels to actually have a significant impact. What is the level of the tax? Ultimately a political decision like all taxation. Who collects it? Probably the importers. Personally I am an agnostic. For people who are really interested in this stuff I’d recommend the recent book co written by Lisa Marriott on this. After reading it: still agnostic. With all taxes the compliance and administration is far more than proponents ever realise. So I’d prefer far tougher regulation on advertising to children before moving to tax. But as part of a package like cigarettes – maybe. And no removing GST from healthy food is so not the answer. Because rich people spend far more in absolute terms on healthy food than poor people do. And like the whole tax free threshold thing – ends up being a bigger tax cut to the rich than the poor. Now dear readers you may have noticed that my weekly postings are no longer happening. I am still fairly active on the blog’s facebook page https://www.facebook.com/Letstalkabouttaxnz/ but full blog posts – not so much. Because busy. Coming up to the election; I have views. And as I am no longer a bureaucrat; will be doing some partisan foot soldier stuff. So maybe a transmission silence until then. I am however fascinated by what is happening and am seeing parallels to the 1984 election. If I get time I will share that with you. But otherwise see you all on the other side – of the election.